Studies are finding that severe reactions occur nearly 20 percent of the time with certain drugs, and in more than half of patients when some drugs are used in combination. Another recent paper found that 30 percent of patients experienced “interesting, rare or unexpected side effects,” with a quarter of the reactions described as severe, life-threatening, or requiring hospitalization. Some patients have died, including five in recent months in clinical trials of a new immunotherapy drug being tested by Juno Therapeutics Inc. In passing, the paper also adds new information about the immunotherapies’ costs, some of which are hitting the $250,000 a year range. I’ve written how, as noble as advances in cancer care may be, the soaring price of treatment is crushing the sick and their loved ones, sometimes undercutting their sustaining optimism as they struggle to cover catastrophic medical bills. Part of the challenge with innovative therapies is that patients and their kin, understandably so, clamor for them. Caregivers and institutions are under huge pressure to provide them. This certainly was a huge factor in Congress’ recent approval of the sweeping, $6.3 billion 21st Century Cures legislation, which critics assailed for giving Big Pharma and medical device makers ways to get their products faster to the public, bypassing long-standing safety procedures. Proponents, including the big crowd of industry lobbyists as well as patient advocacy groups, argued that Uncle Sam needed to get out of the way of drugs and devices that can help the sick. But, as the New York Times points out with cancer immunotherapies, which still are largely experimental, their wider use may make it tougher to track their effectiveness and harms. That’s because even elite research centers that have pioneered these approaches have been caught off guard by unanticipated drug reactions and results, including a proliferation of fast-moving organ death and other conditions, including sudden onset diabetes. One clinician-researcher who had a patient die rapidly after seeming to see a cancer-reverse described immunotherapies as “playing with fire.” It is unclear if hospitals and physicians with fewer resources and less experience with novel therapies will know enough or can muster the care needed to deal with cancer patients’ adverse reactions to new drugs or treatments. Will patients be willing to undergo added treatment for collateral conditions from their novel cancer treatment? Some researchers now say yes. Patients facing a terminal illness may well be prepared to risk death for a shot at the benefits these treatments offer to some. 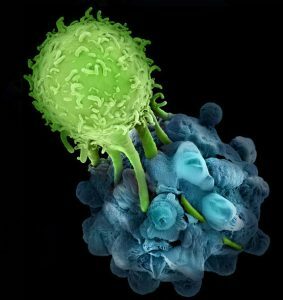 However, the narrative surrounding immunotherapy is that it’s much safer than traditional approaches like chemotherapy, and that there’s not much to lose by trying. Reality is turning out to be different. She stresses how vital it is for patients to give informed consent to experimental care. As I have noted, informed consent is not a casual courtesy, it is fundamental right. And it’s the burden of medical caregivers to ensure that patients grasp, fully and deeply, not only the benefits but also the risks, sometimes considerable, of a proposed course of care. I’ve also written that medical science zigs and zags, and its progress is notably slow and should be careful and thoroughly considered. Breakthroughs, candidly, are rare. This needs to be a key takeaway in stories about improving cancer treatment. Meantime, it may be fascinating and fine reading to learn how infection-destroying viruses or phages offer a potential alternative to the slow, painstaking, costly, and, sadly neglected, development of new antibiotics. At the same time, antibiotic overuse and its massive harms has become a medical science crisis from which lay readers should not be distracted with one-off reports about one individual’s fortune. Let’s not overstate this, especially because the Stat story, by itself, was done well, and phages may well play a key and renewed role in infection fighting. Still, it’s misguided, at best, and potentially unbearably cruel to lead the sick and their loved ones astray with false hopes or partial or misinformation.